Narrowing her eyes before the smartphone screen, my mom tried to take a picture of our Vietnamese lunch. I chuckled at the sight. I thought selfies are for millenials. She then faced the screen towards the two of us. For the first time, I did not instigate this picture-taking session. It’s her idea. My mom belongs to the 70-year-old and above demographic who are thought by many to be slow, outdated and boring. 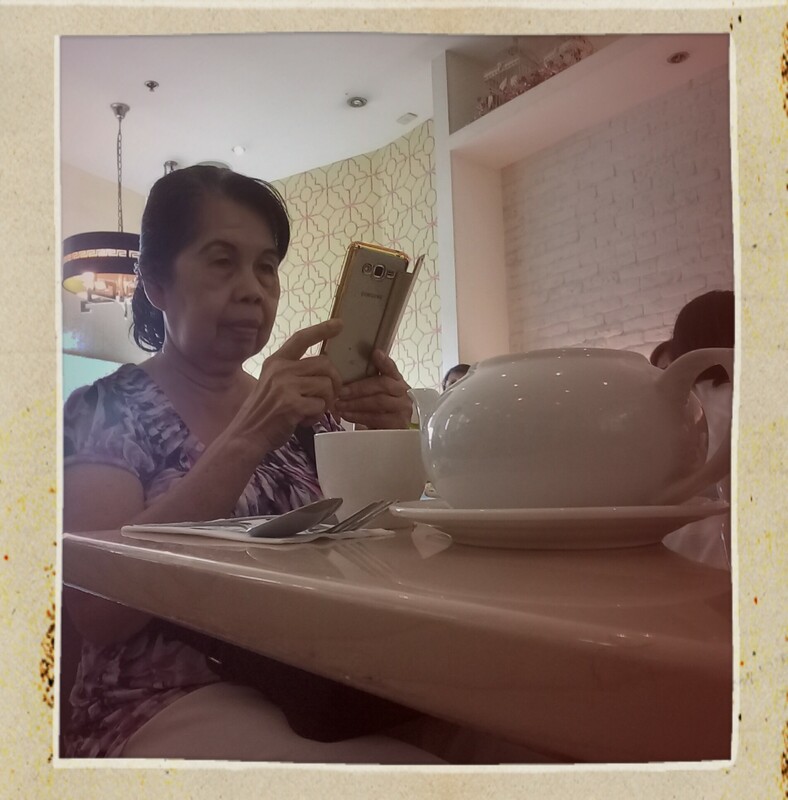 When I encouraged her to use a smartphone, she was scared she would never ever catch up with the wonders of technology. But lo and behold, she has learned how to post and share a video without the technological wisdom of this Facebook guru. And millenials like me find it fascinating. I could still remember the days when we were enthralled with the magic of text messaging. Our first phone was a walkie talkie-like Ericsson (yes, not mine, ours). It was heavy and bulky but I will never forget our fascination of having a handheld phone, especially we never had a landline at home. My mom used it to connect to fellow teachers but most of the time it stayed home. I then had my own Nokia 3310 phone in my last year in high school. It was a luxury then, even though it only had three games (Snake was my obsession, though). This is my very mode of communication with my mom, until my thumbs have mastered the art of fast texting. Fast forward through GMs and unlitexts, many people are relying more on social media messaging because it is easier to send voice messages, documents and pictures. It is also easier to use when reaching loved ones working overseas. I don’t know why most moms (and even dads) are more excited than millenials when they own their FB account. I have heard stories of friends who sometimes find it weird when their parents try to be groovy on their posts (like posting 10 shoutouts about household matters in a day, yep). Some of them have shared horror stories of parents berating their children through social media. I can’t help but laugh out loud when a fellow hiker told us his mother threatened him by posting on his FB page a news article about a mountaineer who died while hiking. His mother did not understand why he’s enjoying what she called a dangerous past time. It had surprised me that Parenting 101 could sometimes be attempted on social media (even for a 30-year-old guy like him). I guess technology has a way in revitalizing everyone. Perhaps, it’s a chance for our parents to try to relate more to us children. It could be their moment to express themselves through social media. My mom would tell me she only want an FB account so she could communicate, especially with my sister, who’s working overseas, and me, who would only come home on a weekend. She wants to see pictures of her grandchildren while commenting how they have grown. She would send me cheesecake recipe videos and watch out how I am doing by looking at my posts and my hiking pictures. Seeing her pop-up on social media from time to time is like being home. It’s communication on a higher level. But it still carries the same message of love. Soon enough, the evolution of messaging may take another major shift and the next elderly generation would have to grapple it again. I believe text messaging, social media and even selfies are not made for the young at all. That’s why it should never take it for granted. Let’s be thankful we have technology that can connect with everyone, even though we are ages apart. “May bayad po yung bata (Is the seat for the child paid)?” A pregnant lady asked another bus passenger rather loudly, her voice sounded quite scandalous in the fully loaded bus to Manila. Sitting comfortably with a little boy beside her, she said “Oo (Yes).” I was ignoring them until an older lady sitting with the boy and mother began to retort. “Kaya nga nakaupo yung bata kasi binayaran (That’s why the child is sitting because his seat has been paid)” She said in a croaked voice. Now the pregnant lady was already given a seat by a younger man. She heard the old lady’s loud murmur and answered back. “Nagtatanong lang naman po (I just asked).” But the old lady kept on murmuring and even called the pregnant lady crazy. Now, I wondered to myself, if she, a grandmother herself, had she not been into the pains of childbirth, too? Besides, all the pregnant lady wanted was a seat, as she was already heavy with a child. But instead of offering her a seat, she was shunned away…maybe offended at the tone of her voice or her seemingly strong presence. The woman was trying to be strong though I’m sure was feeling uneasy. But sadly, the grandmother seemed to have lost the broader perspective. I understand they have paid the child’s seat, and the boy deserve it in place of that payment. But should these people have had the broader perspective of understanding the pregnant lady and her condition, I guess, they would have been even more blessed. Most people have lost the broader perspective and have only focused on themselves. We have the right to for their rights, to shun off every offense, but we don’t see the need of others. The Bible tells us to regard others better than ourselves. The call of humility is easy to scream at, but the endowment of this trait into our system is not that easy. We have been taught to get our rights, but our culture has not taught us to open our eyes and be sensitive to the needs of others. Thus, we fight against each other to get our rights, like dogs eating each other for a piece of stale bread. How should we get a broader persepective? Only when we silence our own selfishness, try to get into the shoes of others, and sacrifice even a little bit of ourselves for them. I admit, I’m still at this battling stage. And with this society, the need to learn humility, as my fellowmen also has the same needs and rights as I do. And as a fellow human being, I must not disregard to my fellow man their needs and rights as I do have. But it’s a long road before everyone in this society, even me, to capture the broader perspective. But let’s begin that journey now. I don’t understand why some schools offer instant learning modules to kids as small as 3 years old. On my way to meet my discipler, I suddenly passed by an ad for a learning institution offering parents that they would can make their 3 year old kids read in just 3 months. Goodness, I would consider myself then as a late learner because I only began to read at 5. I was just scribbling doodles on my mom’s notebook, every encyclopedia books, and our walls at age 3! I must admit, kids are fast learners today. But we can’t expect every kid go along with what we teach, right? I remember one kid in our school who was a luckluster because he was a slow reader. In our society, we consider such as that as slow learners. But we are being too cruel…just too cruel…we don’t remember that not every medal bearer after graduation excel in life. Just as varied as our personalities, our learning abilities are also varied differently. Not every dyslexic, poor in math (as yours truly), or stuttering fellow is a – excuse for the word – dumb fellow. It’s just, we have our own level of interests and levels. Some of us learn quick in this and slow at that…we can’t rate everybody useless if he can’t go with the rest of us. But somehow, this society is quick to label poor fellows. As an excited sanguine who loves to imagine, overeact, laugh to my heart’s content, I’m not safe from the ridicule of kids – and adults of my generation. Somehow, my happy-go-lucky nature had me in the fool’s category. That’s the reason I’m afraid to go with cholerics…or melancholic-cholerics…especially those serious geniuses roaming in the government desks in coats and barongs. That’s the reason we try to pretend. I try to pretend not to laugh at little amusing things…but I can’t help it. We do have our own little pretentions, c’mon admit it. But that’s not going to help. Oh and yes, we don’t have to hate others who are not to our own liking (especially if his personality or his IQ is not at your level). To love is the easiest word to say, but the hardest act to do. When we watch another’s difference, that’s a major hindance. Well, reason why most kids who are called slow learners are the least loved at school and grow in bitterness. Jesus did not look at another’s hindances. He did not even call the beggars idiots or dumb. But He confronted the hypocrites with courage and frankness. I wonder how it is to look at others with love. We call ourselves Christians but we mostly become like the Pharasees who accused the adulteress death. I wonder what did Jesus see to grant her forgiveness. All He had were the eyes of love. I wish to have the same pair of eyes. It’s not impossible. The question is if I’m willing to die to myself and deny myself to have them.